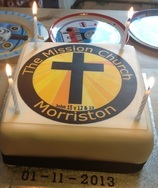 On Friday November 1st 2013 the Mission Church formally began life with the introduction of a number of officially key documents. The seven managing Trustees signed the relevant documents and as a result the first members of the church were recorded - these are Lisa James, Steve James, Claire Bates, Simon Bates, Dawn Fearn, Ian Fearn, Mark Skinner and Mary Skinner. We have a Church Safeguarding Policy, along with Church constitution and rules. To request a copy please click here to email us.